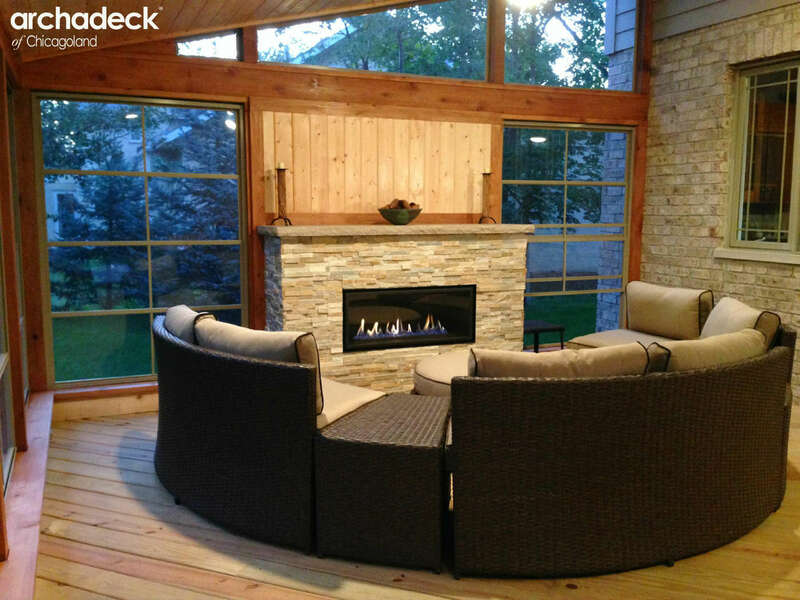 How Can I Enjoy My Outdoor Living Space In The Colder Months? With cooler weather on the horizon, you may be wondering if enjoying your outdoor space this upcoming season is even possible. Wouldn’t it be great if you could still soak in the beautiful sunsets and fresh air, despite the upcoming chilly, Chicagoland temperatures? Adding a room, such as a sunroom or screened in porch is a great way to make the most out of outdoor living as it cools down and can be built with features to make use of the space year round! Screened in porches and sunrooms provide protection from outside elements such as rain, wind, and snow, while still allowing you to enjoy the outdoors. Below are a few of our favorite features that make it easier to use your space throughout the year. These attractive, light weight windows allow you to easily close up the room to protect against rain or snow or open them fully to allow a warm breeze in on sunny days; let in as little or as much of a breeze in as you please. 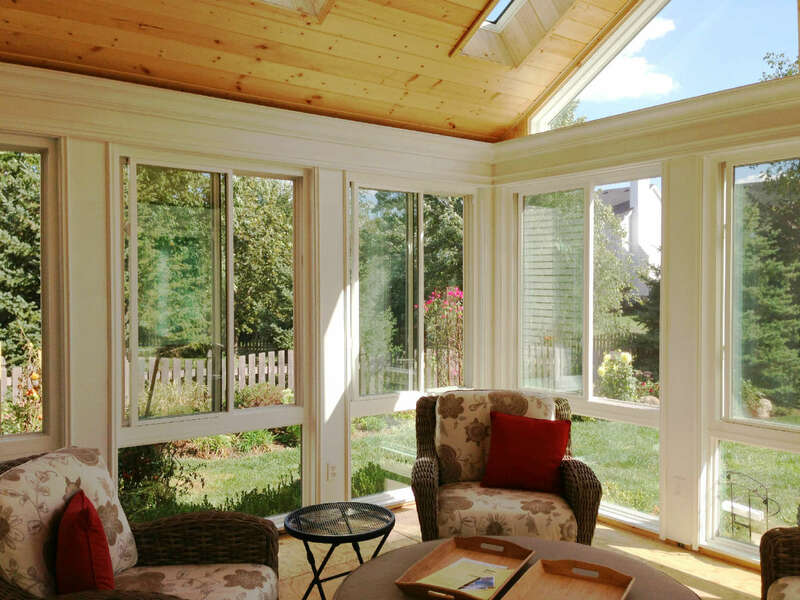 Below are some of our favorite projects featuring Sunspace windows. This rustic style screened in porch integrated cathedral ceilings and Vertical 4 Track Windows to maintain an open, airy feel. The windows let in plenty of light while allowing the homeowners to enjoy the space during chilly months. 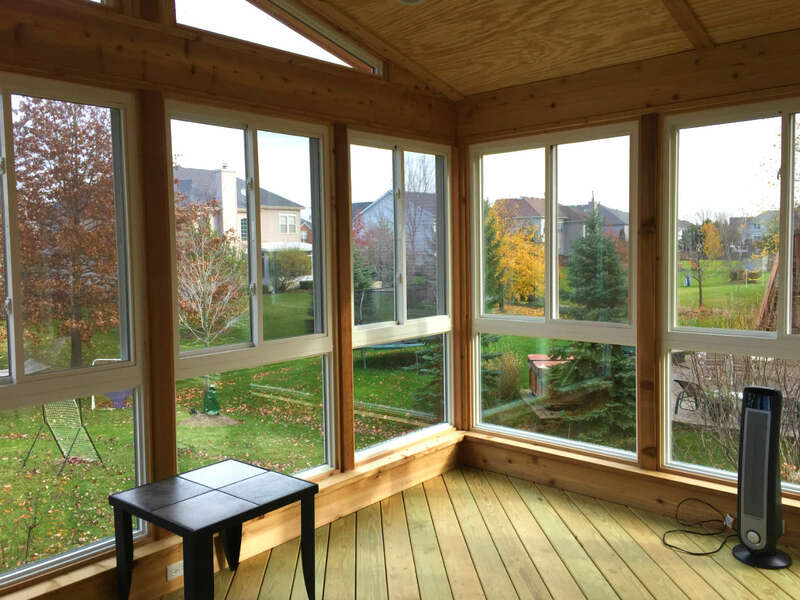 This screened in porch features floor to ceiling Sunspace Vertical 4 Track windows which gives the room a very open, spacious feel. Adding a space heater can warm up the room even more to enjoy on colder days. Integrating an outdoor fireplace into your screened in porch or sunroom is a great way to create warmth and ambiance throughout the colder seasons. Below are some of our favorite rooms with fireplaces. 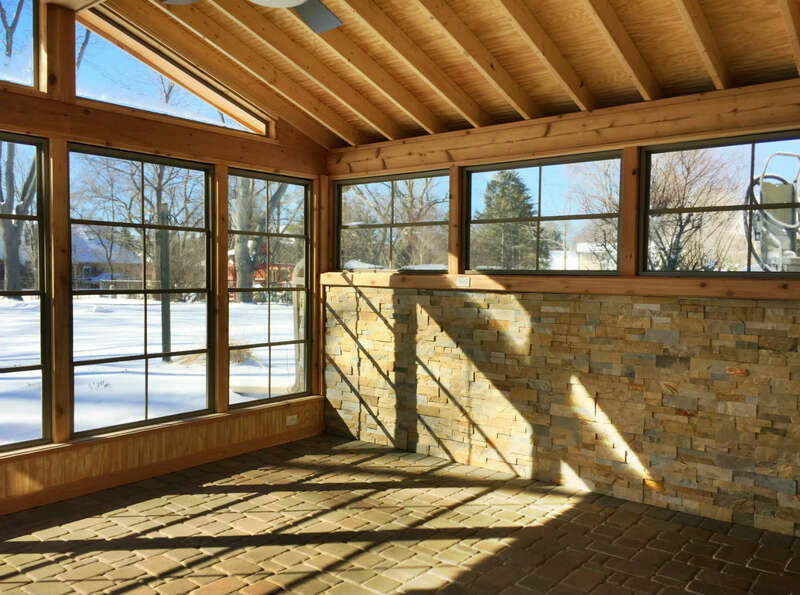 This cedar screened in porch features an outdoor stone fireplace which creates warmth as well as encourages family to gather for entertaining. 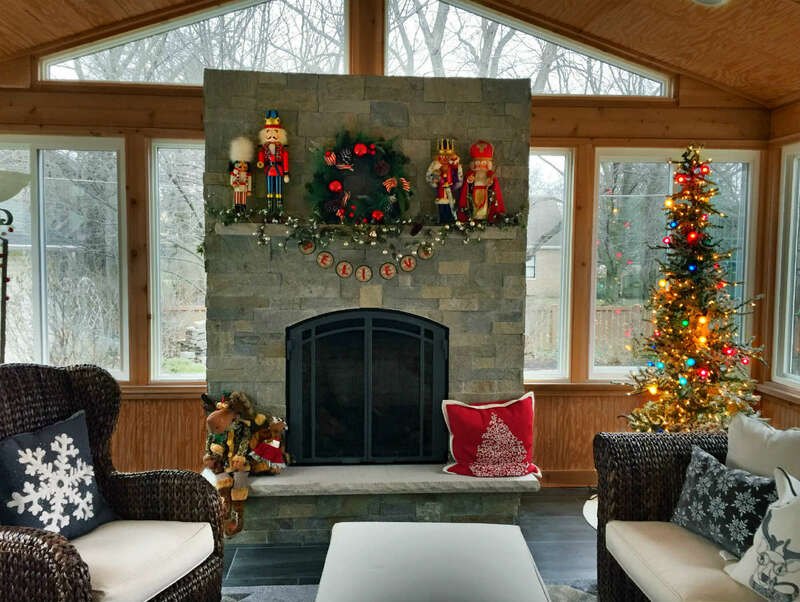 This fireplace makes an eye catching focal point in this sunroom, which greatly compliments the space and makes it more usable throughout the year. 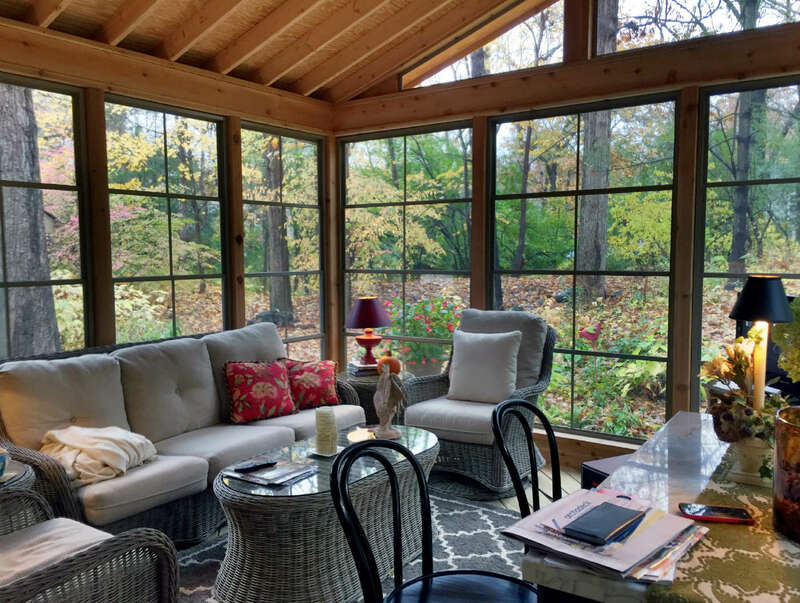 The Studio 41 glass windows we use in our sunrooms truly make these spaces usable when the cold hits by keeping out more chilly air. Check out some of our favorite projects with these windows. These Studio 41 windows ensure more cold air is kept out of your living space, while bringing in additional natural light to the area. These windows open up the homeowner’s view to the rest of the yard, while allowing them to choose how much fresh air to let in. 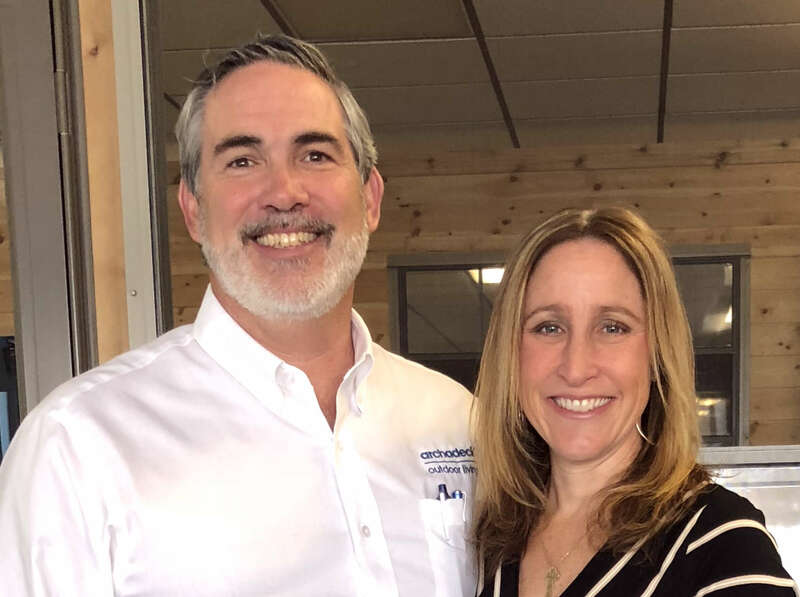 If you’re considering adding a room to your outdoor living space, such as a screened in porch or sunroom, we’d love to hear from you. Call us at 847-496-4333 or sign up for your Free Design Consultation.